This EU budget stuff can come across as pretty dull and confusing. To lighten things up a bit, we will turn to the universal language of football. So meet the EU budget 'Veto Team' - the eleven EU leaders that so far have threatened to veto the EU budget unless they get a better deal. Needless to say, given that this is its first outing, the eleven-man team is far from a cohesive unit - with lots of big egos and players who play for themselves. CF: David Cameron leads the line, ready to strike and seen as the most likely to pull the trigger on any veto. RW: Swedish Prime Minister Fredrik Reinfeldt at right winger hugging the line (sticking to his guns), happy to put in a shift for the team and more likely to offer an assist/support for Cameron than to deliver the final blow himself. AM: French President François Hollande is the mercurial trickster playing between the lines but not quite sure of his role or his aims. Ultimately a selfish player (as are many of the others) but whose own personal gain could ultimately be detrimental to the rest of the team. DM: Italian Prime Minister Mario Monti is playing the stoic holding role, refusing to budge and occasionally gesticulating wildly at the referee, although never actually getting into the danger zone at the forefront of the action. More likely to break up play and provide a stumbling block than deliver a knockout blow to the opposition. Unlike the rest of the team, not here on merit (elected) but parachuted in by the powers above. LW: Portuguese Prime Minister Pedro Passos Coelho takes on the Cristiano Ronaldo role as a marauding left winger and not just because of the nationality. His red line that Herman Van Rompuy's proposal is unacceptable makes him more of a threat than many expected. Under pressure to perform from his home fans (electorate) he needs to put in a big showing – the question remains though whether he will rise to the challenge or crumble under the pressure. 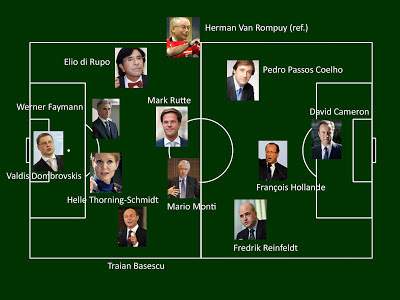 MC: Dutch Prime Minister Mark Rutte is playing the 'box-to-box midfielder' role, akin to the days of Johan Cruyff's 'total football'. Usually more inclined to side with Germany (the opposition), Rutte finds himself dragged end-to-end with action not quite sure where he should be or where he is best suited. One things for sure, his hometown team (the VVD party) would love to see him score. 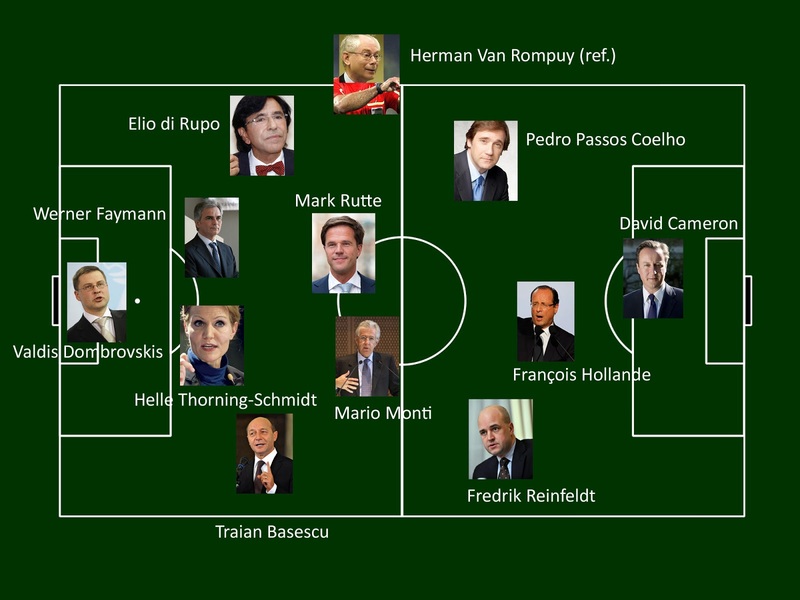 LB: Belgian Prime Minister Elio Di Rupo, naturally inclined to the left, find himself at left back. His demands are relatively minor and he’s not a regular in this team (usually part of the core EU group whose views align closely). He’ll put up a fight for a bit but he’s not a star player in this game. CB: The towering centre-back, Danish Prime Minister Helle Thorning-Schmidt provides a solid spine to the team. Not one of the more flashy players but they know their job and what they want out of it (a clean sheet). Unlikely to score (pull the veto) but will definitely provide a blocker against any increases in the budget. CB: Austrian Chancellor Werner Faymann is another unfamiliar member of the team. Stuck in at centre back because of its experience in the eurozone crisis and playing a key blocking role in minimising the liabilities. Unfortunately, his aims are different in this game and, as with Hollande, he may end up scoring an own goal (getting more spending in the budget). RB: Romanian President Traian Basescu, at right back, is there as a late replacement and now a token entry. The previous incumbent (Romanian Prime Minister Victor Ponta) looked set for an interesting game, but after the substitution this role is unlikely to provide much action. GK: Latvian Prime Minister Valdis Dombrovskis is in goal because, well, the smallest kid always gets stuck with the worst job. He may be on the same team? but if I was Cameron I'd watch out for Hollande tackling him from behind! Barroso is quite good at playing the offside trap. Verhofstadt is in the stands, making monkey noises. He's been reported to UEFA. I think cameron is more likely to be caught offside. This really is trivialising the whole issue. There's enough b***y football in the papers and on the TV with all ITS corruption, fouls, sackings etc without clutterring up this precious space. I though the referee was supposed to be impartial. Before kick-off, they are on different sides, The only solution is for Cameron to hang-up his boots forever and stop playing with these people [ie leave the EU].